There’s a blizzard outside today so I felt inspired to find a wedding cake that was inspired by snow. I know, it would make more sense to find a beach-y wedding cake, but let’s stick with the snow for today. 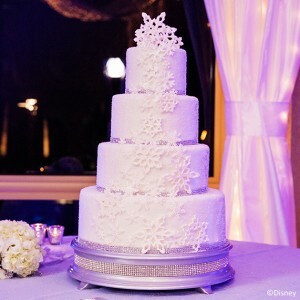 In my search for that perfect snowy wedding cake I stopped by Disney’s Fairytale Weddings & Honeymoons site and found this stunning cake! This four-tier cake sparkles like a fresh blanket of snow and is adorned with beautiful white snowflakes in every shape and size – which makes it perfect for your winter wedding! And there’s even a Mickey Mouse-shaped snowflake somewhere on the cake. Even if you don’t like snow, you have to admit this is one stunner of a cake! 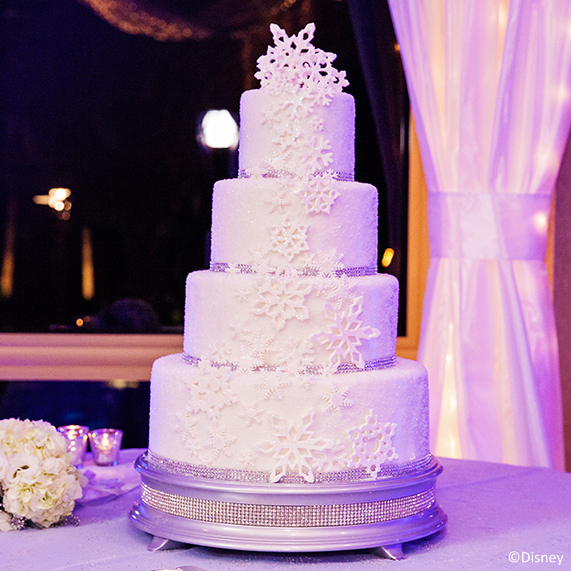 We found this wintry wedding cake over at the Ever After Blog at Disney’s Fairytale Weddings & Honeymoons! And the photo is from White Rabbit Photo Boutique.